The highly-anticipated floor-test in Karnataka assembly never happened with BJP's Yeddyurappa tendering his resignation - paving the way for HD Kumaraswamy to bring in a JDS-Congress combine. BENGALURU: BS Yeddyurappa resigned as Chief Minister just two days after he took the oath of office, leaving the political field clear for HD Kumaraswamy to lead a JDS-Congress combine to take oath on May 23. Just ahead of the trust vote in Karnataka Assembly, Yeddyurappa addressed the House and conceded defeat. An emotional Yeddyurappa said that the situation would have been different if the people would have given just a few more seats to the BJP, enough to make them win the majority. "If only people would have given us 113 seats instead of 104, we would have made this state a paradise. Whether I stay in power or not, I will continue to work for the people. And we will get 28 out of 28 seats in Lok Sabha. For now, I will go to Raj Bhawan and tender my resignation." The Assembly session began on Saturday morning with newly-elected MLAs taking oath. They were administered oath by Protem Speaker KG Bopaiah. Yeddyurappa took the oath first, followed by Congress Legislature Party leader and his predecessor Siddaramaiah. Then the other members started taking oath in batches of five one after the other. The floor test was scheduled for 4 PM as per the Supreme Court's Friday ordered that drastically reduced the 15-day window given by the governor to Yeddyurappa to prove majority. While it was a battle for the chief ministership between JDS leader HD Kumaraswamy and BJP's BS Yeddyurappa, the man who emerged as the hero for the winning JDS-Congress alliance was Doddalahalli Kempegowda Shivakumar, popularly known as DK Shivakumar. Amid the political parleys and the fears of horse-trading, it was Shivakumar, Minister of Energy is the Siddaramaiah government, who kept the winning alliance flock together, and made sure that there was no defection. And this not the first time when the Congress man came to the rescue of the party. Read details here. HD Kumaraswamy is likely to take oath as the Chief Minister of Karnataka along with 20 MLA of the Janata Dal Secular (JDS), 13 MLAs of the Congress, say sources. The alliance reportedly has a reached on 20-13 agreement. Congress leader G Parameshwara is likely to be sworn in as the Deputy CM. Read details here. Kumaraswamy clarifies that the date of swearing-in ceremony has been changed to May 23 because May 21 is Rajiv Gandhi's death anniversary. PTI reports that the date of swearing-in ceremony has been changed from Monday (May 21) to Wednesday (May 23). Congress has distanced itself from Sanjay Nirupam's remark comparing Karnataka Governor Vajubhai Vala to dogs. BJP though has come out all guns blazing. "We have invited leaders of several regional parties to be part of the oath-taking ceremony. It would take place between 12 noon and 1 but the exact time will be decided by Sunday. There is absolute unity between JDS and Congress, and we will meet later tonight to work out the modalities of the government. 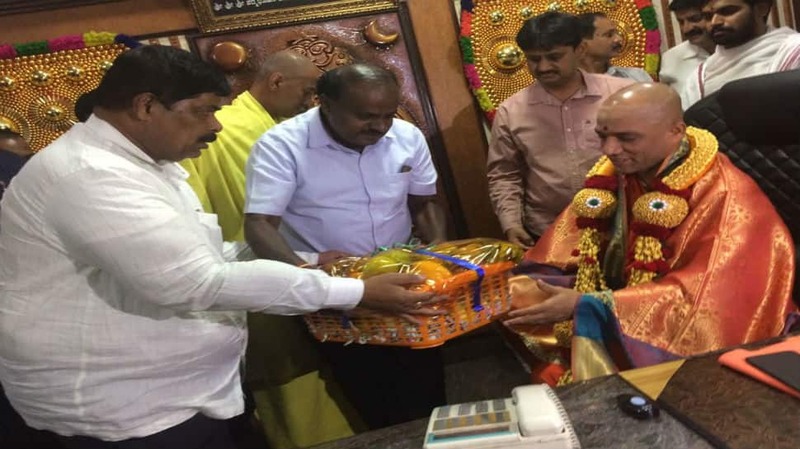 We have also been given 15 days to prove majority and we are obviously confident of it," says Kumaraswamy. Mamata Banerjee says Kumaraswamy has invited her for the oath-taking ceremony on Monday. Banerjee had previously tweeted congratulating Congress-JDS combine. Kumaraswamy reaches Raj Bhavan where he will meet Governor Vala and stake claim to form Karnataka's next government. "When Supreme Court rules in their favour, they are okay. When something goes against them, the juduciary has been compromised. They have made derogatory statements against Governor, Army chief. They don't trust media, CAG, no one. Rahul Gandhi even called PM corrupt - is this the way to do politics. They have not indulged in anything except corruption for decades." Prakash Javdekar of BJP calls Congress-JDS an unholy alliance. "They abused each other before elections. Congress even said JDS is BJP's 'B' Team. Now who is exposed? We have taken the moral victory from all of this. The future of the alliance is shaky. Responding to Rahul Gandhi's allegations against PM Modi, BJP's Ananth Kumar said: "What is he saying about PM Modi? This is the PM who has provided a scam less government. If he puts such an allegation, the people will say he has lost his mind." Governor Vajubhai Vala has accepted BS Yeddyurappa's resignation. JDS leader H D Kumaraswamy has said that they are not in any hurry and will wait for an invitation from the Governor. Rahul Gandhi: You've seen openly how the PM directly authorised purchasing of MLAs in Karnataka, so the idea that PM spreads in the country that he is fighting corruption is a blatant lie, he is corruption. Rahul Gandhi: They disrespected the mandate of Goa, Manipur. One after the other. I am very proud to say that in India, power is not everything, money is not everything, corruption is not everything. Rahul Gandhi: I am proud that Opposition stood together and defeated the BJP and we will continue to do so. Rahul Gandhi: Did you notice that after the entire exercise in Karnataka Vidhana Soudha, the BJP legislators and Speaker chose to leave the House before the national anthem? It shows they can disrespect any institution if in power, both BJP and RSS have disrespected institutions. "Victory of democracy, victory of Constitution"
Ghulam Nabi Azad, Congress leader: I thank and congratulate the judiciary who rose to the occasion and brought the time frame down from 15 days to 1 day to prove the majority. The Governor had given time to the BJP for horse trading but when we approached the SC, they saw no reason why BJP should be given 15 days for trust vote. Ghulam Nabi Azad, Congress leader: Thank MLAs for standing up to all arm twisting and temptations by the Central government. Some of our MLAs were kidnapped and taken into illegal custody but as and when they got the opportunity, they ran away from them and supported the party. Congress MLA Roshan Baig: Yeddyurappa had no other option but to resign. Yes, Congress and JDS fought against each other in some seats but everything is fair in politics. Celebrations have begun in the Congress camp soon after Yeddyurappa announced his resignation. Visuals showed Congress MLA DK Shivkumar with JDS MLA HD Kumaraswamy and other MLAs at Vidhana Soudha showing victory sign. After his speech at the Vidhana Soudha, Yeddyurappa has reached the Governor's House to tender his resignation. During his speech, he said: "I will lose nothing if I lose power, my life is for the people." Congress is elated as Yeddyurappa announced his resignation. Congress is claiming the BJP never had the numbers but formed government only through a 'setting' with the Governor. Yeddyurappa chokes up, says if the people of the state had given the BJP 113 seats, the entire picture of the state would have been different. However, he requested all members to have faith in the democratic process. Lauding Prime Minister Narendra Modi, Yeddyurappa said he did not show any partiality although the state was ruled by Congress. Questioning the work done by the previous Congress government, he said: "You have not been able to provide clean drinking water or water to the farmers. You have not been able to serve the farmers, the backward classes or the minorities. In democracy, the important thing is not who got how many seats. What is important is what the people want." BS Yeddyurappa assured that he will serve farmers till his last breath. "The people of the state, especially the farmers, who are frustrated need justice. They need to live with pride, and dignity and self respect. I want to give confidence to the people of the state with this Assembly. This country's 'annadata' is the farmer," he said. Yeddyurappa hits out at Congress, says Siddaramaiah had vowed that he would not let Kumaraswamy. "People have blessed us with 104 seats. The mandate is not for Congress or JDS," he said. BS Yeddyurappa begins speech in Karnataka Assembly, says he was asked by Prime Minister Narendra Modi and BJP president Amit Shah to be the CM face of the party. He thanked people for trusting them with their votes and making BJP the single largest party. 'Missing' Congress MLAs Anand Singh and Pratap Gowda Patil have returned to the House. Congress seems to be pretty confident of defeating the BJP. Party leaders Ghulam Nabi Azad, Ashok Gehlot, Mallikarjun Kharge can be seen sitting in the Vidhana Soudha. BJP leaders Ananth Kumar and Shobha Karandlaje are also seen in Vidhana Soudha. BJP MLA Somashekara Reddy denied reports that he was with two 'missing' MLAs -Anand Singh and Pratap Gowda Patil. Reddy said he was with his brother in Taj West End. "Nobody was in my contact. I don't even know who are they. I did not even go to Goldfinch Hotel," Reddy said. BJP is holding back its comments on the floor test for now. When BJP's Shobha Karandlaje was asked about the floor test, she smiled and said: 'Wait and see. In politics, every decision is wonderful and happy." While Congress MLA Pratap Gowda Patil was entering the House, party leader DK Shivakumar wanted to meet him. However, he was not allowed to speak to him as Patil was taken inside under police security. Union Minister Ananth Kumar and CM BS Yeddyurappa are present in the chief minister's chamber in Vidhana Soudha. The Congress is confident that they have the numbers to defeat the BJP in the floor test. Congress MLA Pratap Gowda Patil has reached the Vidhana Soudha. In pictures coming out of the Assembly, he can be seen having lunch while Congress leaders DK Suresh and Dinesh Gundu Rao are present with him. Congress has exuded confidence that Yeddyurappa will resign before the trust vote. "I am sure he will resign before the trust vote," Congress leader K Shivakumar said. He also stated that Congress MLA Pratap Gowda Patil who was 'missing' has come to the House. "He will take oath as an MLA then he will vote for the Congress. He will not betray the party," Shivakumar added. 'Missing' Congress MLAs Anand Singh has been seen leaving Goldfinch hotel in Bengaluru ahead of the trust vote. Sources say that Yeddyurappa is likely to resign ahead of the floor test if he feels that he does not have the majority to win the trust vote. As per sources. he has prepared a 13-page speech which he will deliver ahead of the trust vote. As per Zee News sources, the two Congress MLAs, Anand Singh and Pratap Gowda Patil, who were reportedly missing, are being brought to the assembly. The two have not yet come to the Assembly to take oath. The city police has imposed Section 144 of the Criminal Procedure Code (CrPC), prohibiting assembly of five or more persons 1 km in and around the secretariat to maintain law and order for the day-long session. As per the directions of the three-judge bench of the apex court, security has also been provided to all the legislators participating in the floor test. The police have also banned processions or rallies by the cadres and supporters of the BJP, Congress and JDS in the area. Karnataka Assembly has turned into a fortress ahead of the trust vote. There is heightened security and extra vigil in and around the House. "Elaborate security arrangements have been made at the secretariat and the nearby legislators' home to facilitate smooth conduct of the assembly proceedings for the floor test," Director General of Police Nilamani Raju said. Congress has alleged that the BJP is trying all it can to buy the MLAs. "BJP will be exposed to the whole world. They know very well that they are 104, still they are trying everything and anything to buy our MLAs. But, our MLAs are intact. Two of our MLAs are still not here, whenever they come they will surely support us," Congress leader Veerappa Moily said. As per Zeenews sources, some close aides of HD Kumaraswamy are unhappy with him and are likely to abstain during the trust vote. They are said to be unhappy over HD Kumaraswamy being the CM candidate.